This morning, Friday, January 29, 2016 I go out for my daily walk. It’s a stormy day but I start out during a sun break. I look up at a blue patch of sky and see Edna. I walk across a small stream. As I look down into the water from the bridge above, I see Edna’s face. As I continue up the hill, cold rain replaces the sunbeams. This is what it's like when you lose someone close to you. You just keep thinking of them, seeing their face wherever you look. Who was Edna? To me, she was an aunt by marriage. 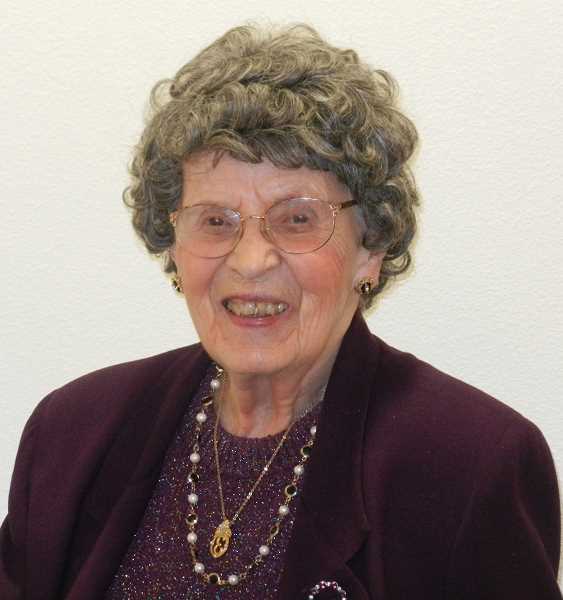 She graduated from Linfield College, McMinnville, Oregon in May, 1941 with a major in home economics and a minor in business administration. She married Kenneth Williams in Buhl, Idaho, her home town, in June, just after she graduated from Linfield. She died at age 96. Edna and Kenneth settled in Newberg, a Willamette Valley town south of Portland, near to several of Kenneth’s family members and a few miles north of Linfield College. About twenty years later when I came to know her, Edna was employed as a legal secretary in a Portland law firm. I was so impressed as a young person to know that my new aunt-in-law worked in a law office downtown. Her longest tenure was as secretary of the dean of students and registrar at George Fox College. She could walk to work from her home. I imagine her looking over the heavy wooden Dutch door of her office, or the counter, responding to an inquiry for a student. No-nonsense and business-like with a helpful spirit. Maybe I’m confusing Edna a bit with my mother. They were much alike: light of build, about 5’8” tall, slightly reserved, known for deeply-felt friendship. They were personality-perfect for dealing with the public and maintaining orderliness in all affairs. Moreover, Edna’s home was always open to relatives. My wife’s memories of her childhood visits to Edna’s home include wonderful food, especially the creative Jell-O salads and delicious baked ham. Lucy wistfully recalls Edna’s wonderful hand knitted clothing, especially the socks. Above all, her warmth and the twinkle in her eye. Lucy’s family visited Kenneth and Edna very frequently, as often as they could. Edna lived a wonderful life, gave the world two great children and outlived her husband. After Kenneth's death, Edna intrigued relatives with news of a proposal or two she received from male co-residents in Friendsview Manor, Newberg, where she then lived in retirement. “Well, did you say ‘yes’?” Someone asked that question after Edna told the proposal story. I’m nearly back home on my Saturday walk, the rain subsides and the sun shines down on me again. The warmth reminds me of Edna. Edna, Edna--I just keep thinking of Edna—thinking of this terrific woman. That’s how it is when you lose someone with whom you are close. Continuing the day, it’s now Saturday afternoon. I join as Edna’s family members and friends from Oregon and Washington, gathered in the sanctuary of the Friends Church on College Street in Newberg. We listen as speakers affirm Edna’s person and her faith. We quietly sing a couple of famous, traditional Christian songs. Then we reassemble for re-union in a church hall. We see Edna’s life as depicted in a lifetime photo-board. We renew old acquaintances. We laugh. We smile. I’ve experienced the healing part that happens when you lose a loved one. I drive home thinking about Oregon events of the week, both the one in Burns that I've read about and the wonderful one I've just experienced, and I conclude that I’ve personally just experienced the true heart of the real Oregon. When you think about the real Oregon and any real human society, think about the Aunt Ednas to find the society's heart and soul.